When I was a student in Vientiane, street food was a huge part of my daily life. There was always a woman at a stand under a tree selling different delicious foods; Kua Mee, stir-fried noodles with pork and egg, was one of them. She would sell it on banana leaves or newspaper. I would order one and eat it with my hands while walking home. Even after all these years traveling back to Laos, I still find it on the streets; perfectly cooked and served traditionally. 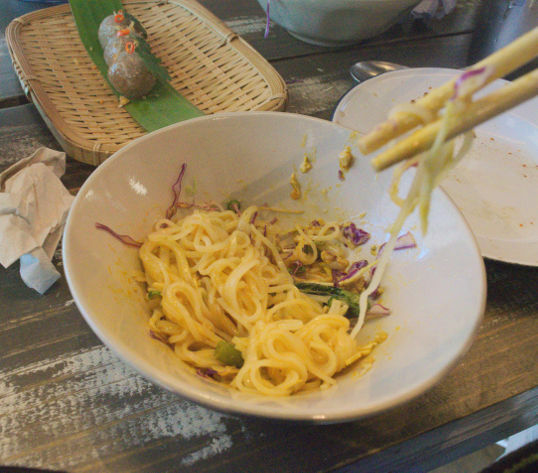 It feels irresponsible to hype a restaurant as small as Khao Noodle Shop. With just four tables and a counter, this isn’t a dining room meant to handle legions of fans, and the pint-sized kitchen isn’t meant to attract national attention. But national attention is coming, and Khao — with its modest strip-mall space in Old East Dallas, just across the street from Jimmy’s Food Store — is a new milestone in Dallas’ culinary history. Few restaurants cultivate such an intimate connection between the food on the plate and the broader context in which it is served. 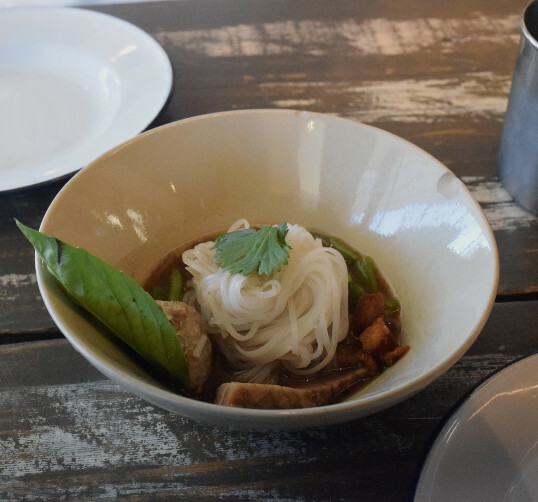 Go ahead, take a bite of Khao’s Laotian noodles and snacks — and pair that bite with a side of Dallas cultural history. I know that neighborhood (though I get hopelessly lost every time I go there… the streets are all on these crazy diagonals) – I’ve written about Jimmy’s Food Store (seven years ago!) and only a few blocks away is another set of excellent restaurants that we visited only a short time ago. 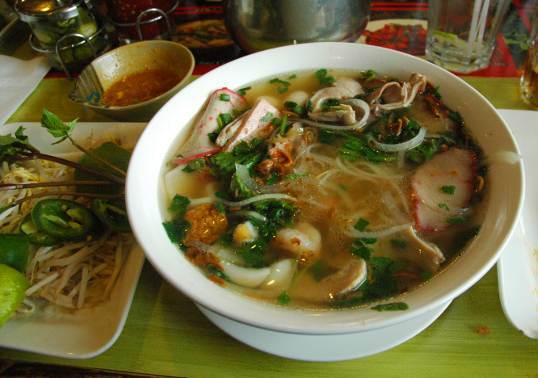 The area is becoming a hotbed of Laotian food and culture. 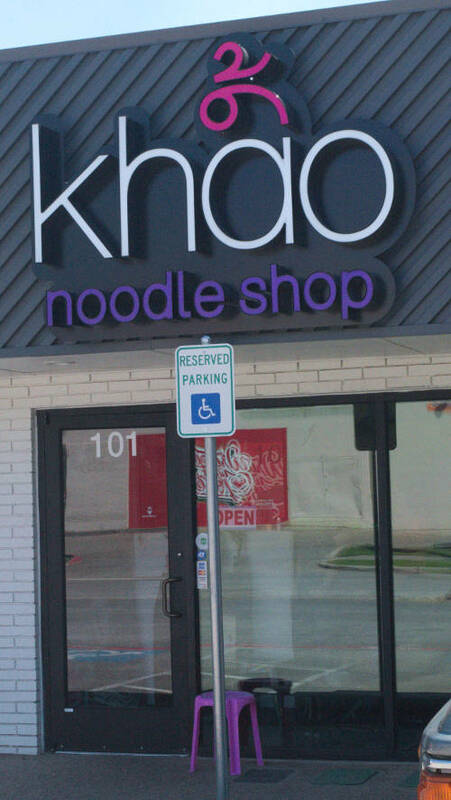 And now this Khao Noodle Shop – one of Texas’ best new places – have to give it a try. I texted my son Nick – “Noodles!” and I drove by, picked him up, and wandered the streets (lost, as always) until we found the Khao Noodle Shop. It was full at one o’clock on a Sunday afternoon, but there were a couple spots at one of the six-tops. It is small – it looked like there were as many cooks and waiters scurrying behind a glass partition as there were customers. I had read the review and knew what to expect as the waitress handed out menus. 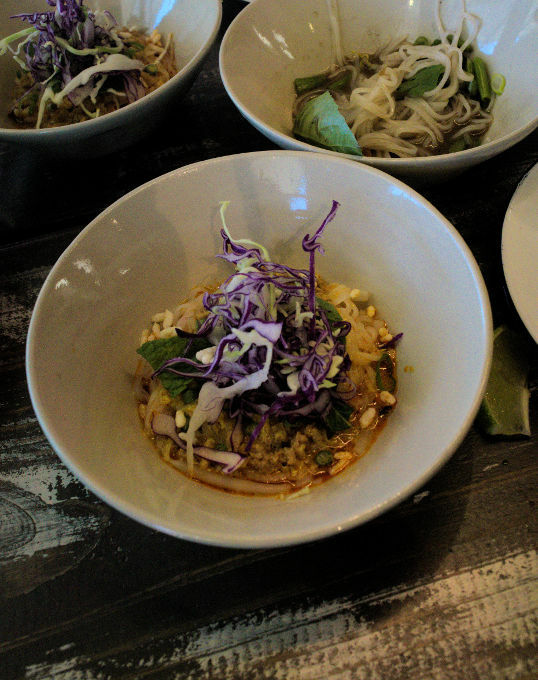 The idea is to order a number of small bowls of noodles and shareable appetizer plates. We were in the mood for noodles – so we ordered four bowls and only one appetizer. The food was fantastic. 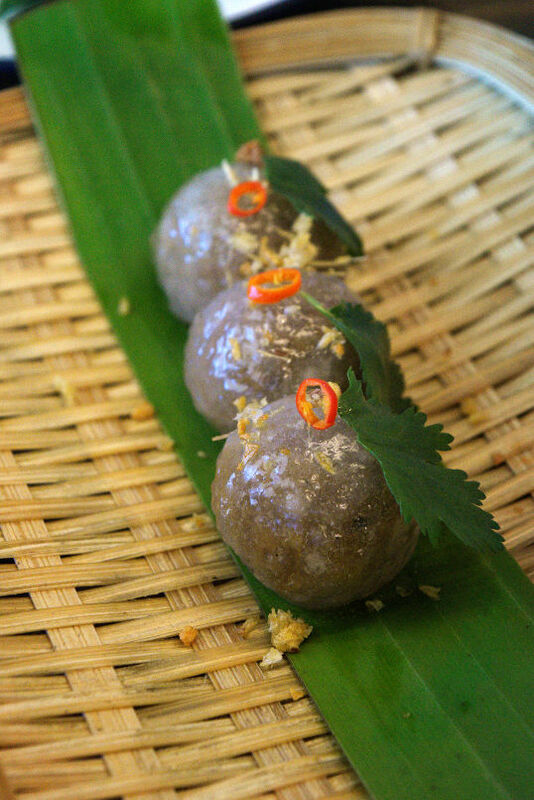 Especially wonderful were the Sakoo – tapioca dumplings. They had an amazing texture – gooey, yet firm, with bits of radish inside to add some crunch. Sakoo dumplings from the Khao Noodle Shop, Dallas, Texas. The waitress told us to remove the red rings if we didn’t want spicy. We, of course, left them on. 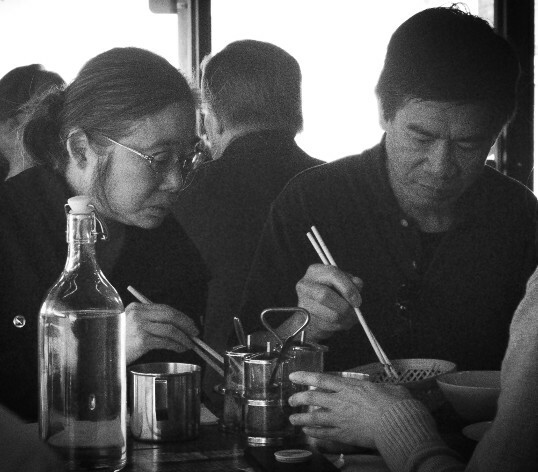 Making the noodles disappear, Khao Noodle Shop, Dallas, Texas. We could have ordered a lot more. We asked the waitress what was the record for noodle bowls at a six top table. She said, “Forty or Forty One.” Nick and I and four friends? We could do forty without trying. No problem. 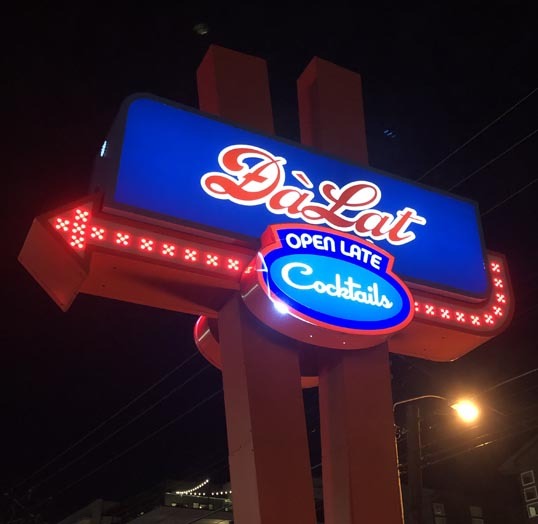 A small unassuming place on the outside – but deliciousness is hiding within. “The English are kind of weird when it comes to the way things taste, Mom. They aren’t like us. It might be the climate. They go for things we would never dream of. Sometimes it is enough to turn your stomach, boy. The other day I had had one of these things they call ‘wine jellies.’ That’s their idea of candy, Mom! Figure out a way to feed some to that Hitler ‘n’ I betcha the war’d be over tomorrow!” Now once again he finds himself checking out these ruddy gelatin objects, nodding, he hopes amiably, at Mrs. Quoad. They have the names of different wines written on them in bas-relief. Darlene comes in with a steaming pot and three cups on a tray. “What’s that?” Slothrop a little quickly, here. “Quite right,” after the first sip, wishing she’d used more lime juice or something to kill the basic taste, which is ghastly-bitter. These people are really insane. No sugar, natch. He reaches in the candy bowl, comes up with a black, ribbed licorice drop. It looks safe. But just as he’s biting in, Darlene gives him, and it, a peculiar look, great timing this girl, sez, “Oh, I thought we got rid of all those—” a blithe, Gilbert & Sullivan ingenue’s thewse—“years ago,” at which point Slothrop is encountering this dribbling liquid center, which tastes like mayonnaise and orange peels. “You’ve taken the last of my Marmalade Surprises!” cries Mrs. Quoad, having now with conjuror’s speed produced an egg-shaped confection of pastel green, studded all over with lavender nonpareils. “Just for that I shan’t let you have any of these marvelous rhubarb creams.” Into her mouth it goes, the whole thing. Everyone has their Christmas traditions. I’ve been keeping this incarnation of a blog since 2011 and we went to Bistro B for Christmas that year, so it’s been at least seven years. I think this is the first year we actually received what we ordered. Nothing much has changed, so I’ll copy what I wrote then. 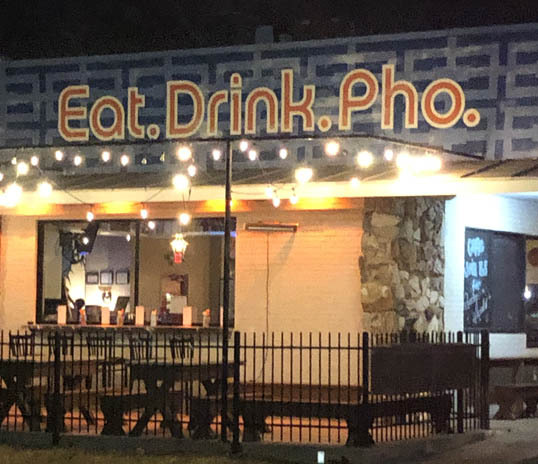 The only difference is this year I ordered #33 Special Pho with Sunny Egg, and #395, Vietnamese Iced Coffee – in addition to a shared double order of #9 – Vietnamese Spring Rolls. The wrapping paper has been rent and Santa has been sated. The day now stretches sleepily on – sports on television, fudge on the kitchen table, a cold, gray spitting rain day outside. What is there to do other than lounge around in a mouldering Snuggie® and watch the entropy increase? For my dollar, there is no better way to spend a few hours on the Christmas Holiday than to go for an afternoon lunch at Bistro B. 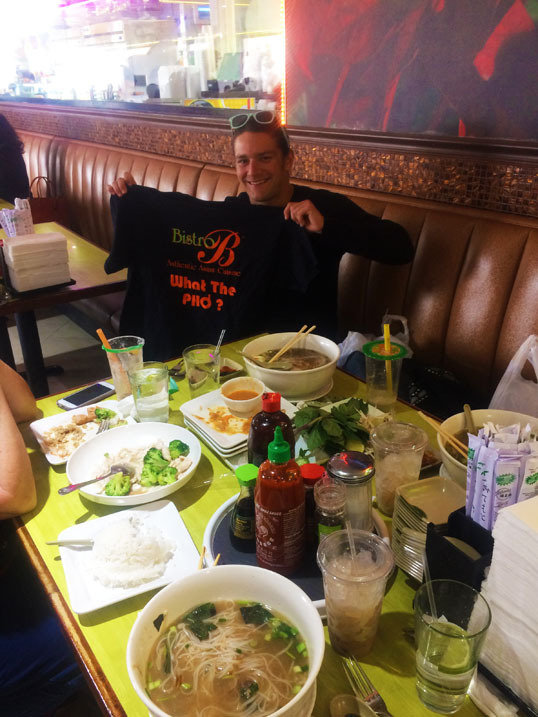 Actually, I like the pho at Pho Pasteur near our house (the broth is just right) but Bistro B is such a hopping place, even on a holiday, that is impossible to pass up. Plus, Pho Pasteur isn’t open on Christmas Day. It didn’t take long before we were seated and began to attack the menu. There are too many choices at Bistro B – the menu is a little spiral bound plastic laminated book, with page after page of wonders, many with photographs of the food. It is intimidating. Lee recommended shutting my eyes, thumbing through the menu blindly, and then picking something at random. He said he did that a couple of times – once he had something good, but the second time the waiter had told him, “No, you don’t want to order that.” I tried it and came up with Chicken Curry… no, too tame. The menu items are numbered and the numbers go up 523 – though there seems to be some gaps here and there. It was cold outside so I thought about some hot soup. I ordered the #43, Special Bistro B Noodle Soup. The waiter asked what type of noodles and I asked for rice. The kids had smoothies and Candy and I hot tea. Nick had Pho, Candy and Lee had chicken. We sent for a couple orders of spring rolls… it was too much food. My soup as it arrived. What mysteries await in these warm and fragrant waters? But it was delicious. 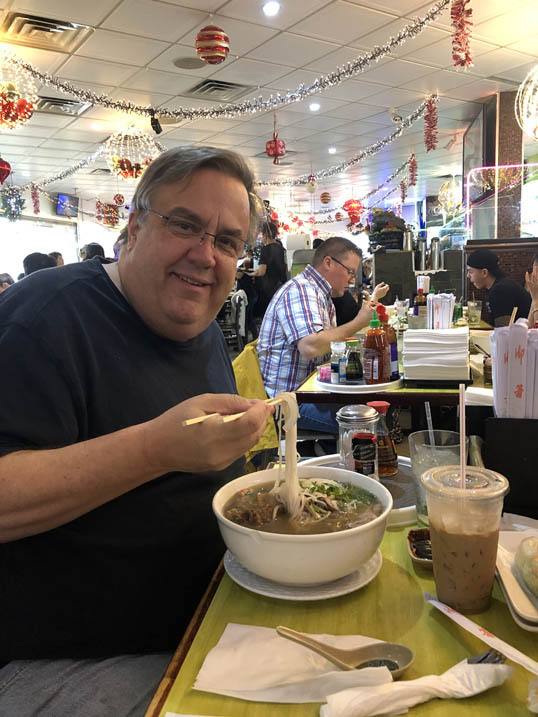 My Special Bistro B Noodle Soup didn’t have the perfect simple balance of subtle flavors that I like in Pho – but it was like eating a Forest Gump box o’ chocolates – you never know what you are going to get. Every time my chopsticks would dive into the spice-murked liquid they would emerge with a new surprise. After eating whatever came to the surface – I was able to figure out more or less what it was about half of the time. 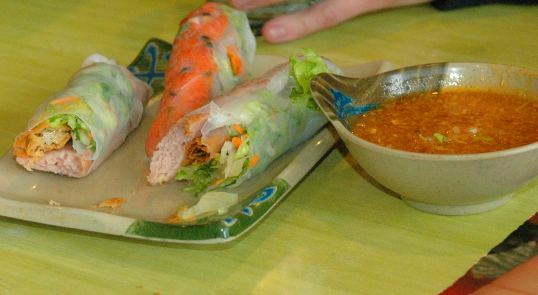 Like all Pho – serving places, the table was equipped with a bounty of condiments and additions. Plates of bean sprouts, sliced jalapeño, Thai basil, and cilantro. Bottles of soy sauce, fish sauce, rooster sauce, hoisin, and two unlabeled bottles of mysterious somethings. Plus little containers of chopped garlic, pepper oil, and the most flavorful (and hot) chili paste I’ve had in a long time. I spent some time working on the flavor balance of hot and sweet, salty and savory, in my broth. Then I used the hoisin and rooster sauce to draw a bright red and dark caramel ying-yang symbol (for good luck in the coming year) in one of the little plates they supply and used my chopsticks to dip various morsels in there before I ate them. I ate ’till I was full and then I ate some more. And it was good. There was a separate menu on our table that outlined the group meals. We thought about the dinner for four – but there were too many fish items on it for Candy. They had a dinner for ten that looked fabulous. I need to get ten people together to go down and do it. That sounds like a plan. Drop me an email if you want in. 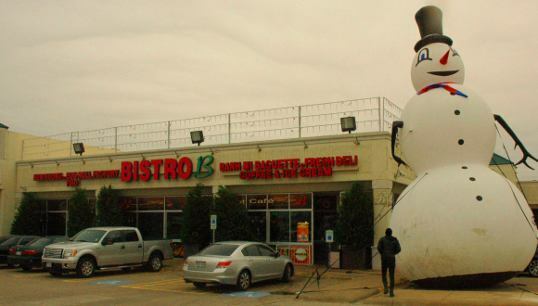 The outside of Bistro B – complete with a vaguely unnerving inflatable snowman. East Dallas is a confusing web of intercrossing diagonal streets – impossible to keep north, south, east and west straight. It’s a neighborhood of constant change, mixed wealth, and diversity. It’s a favorite part of town to me. 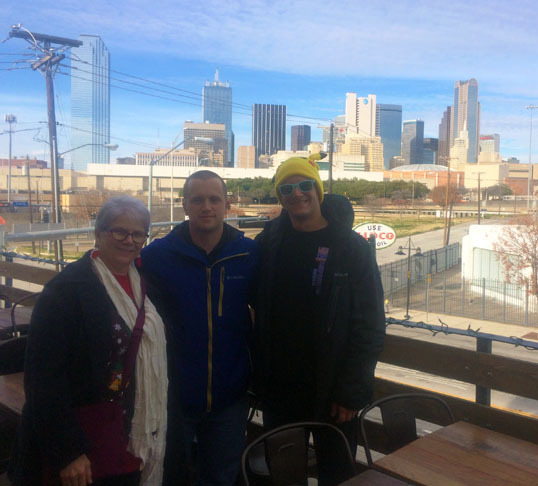 Last night, as a Christmas present the kids bought all of us tickets to the Dallas Stars hockey game and because it was four of us, it was late, and I know of a good place to park I drove downtown rather than take the train or Uber. The game was fun even though the home team lost in a futile flurry of razor sharp blades, sticks, and ice. One cool thing was that, at the very end when all seemed lost, right before the Stars pulled their goalie the stadium played the “Horn of Helm Hammerhand” clip from “The Two Towers” on the big video boards. It was inspirational and Lee stood up and yelled, “I’ll follow you anywhere Aragorn!” Unfortunately, right after that the visiting team pushed in an empty net goal – it was all for naught. After the game, we wanted to eat, and we wanted pizza. 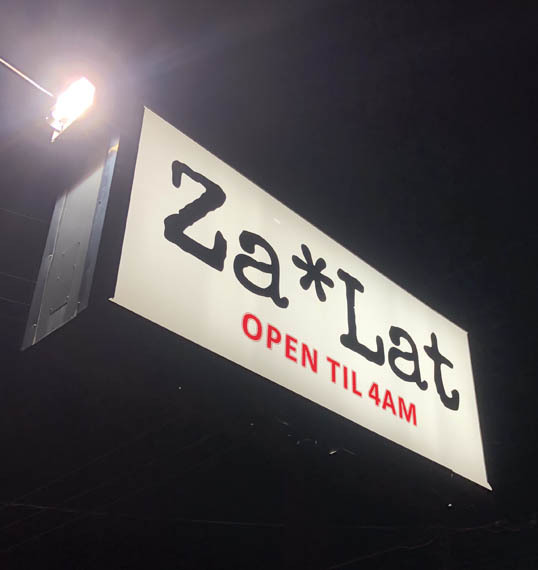 It was late and a lot of spots downtown were closing, but Nick knew of a place open really late so we drove down Fitzhugh to Za*Lat Pizza. 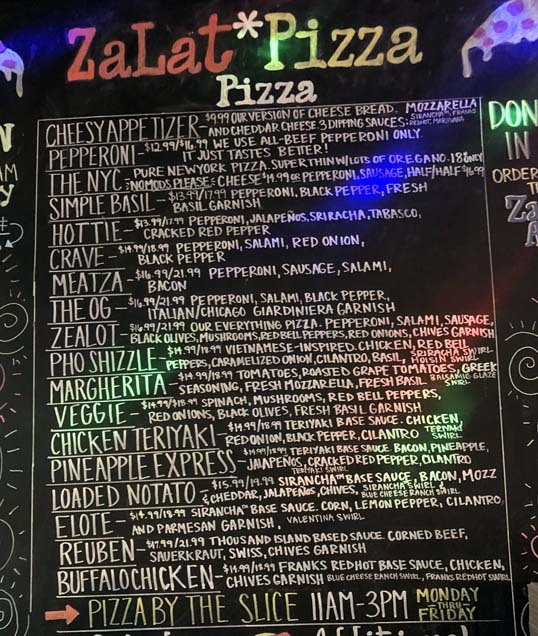 They had a very impressive list of crazy pizzas – but we weren’t in an overly adventurous mood and settled on a large pepperoni. 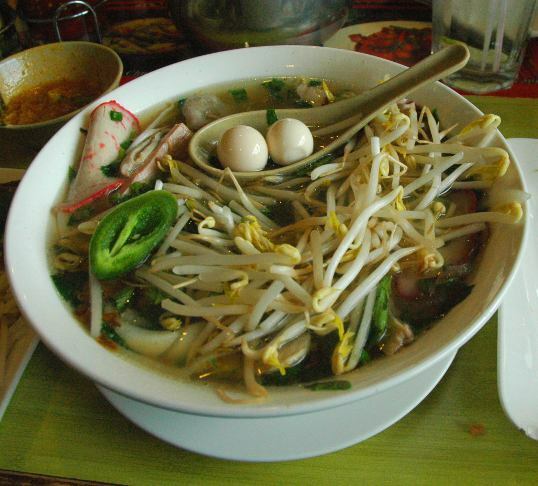 I’m going to have to go back, maybe ride my bicycle there, and try the Pho Shizzle Pizza…. and maybe the Elote Pizza… or maybe a bunch more. 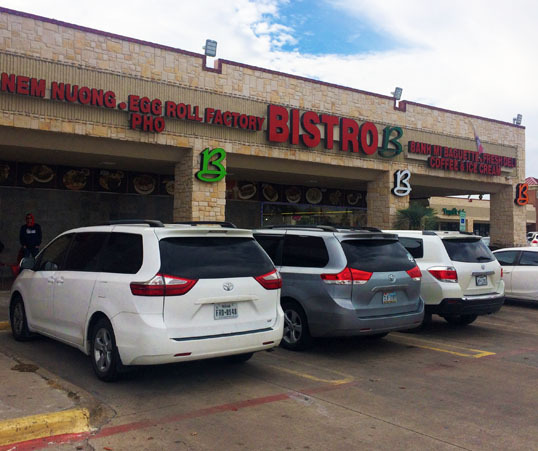 DaLat Vietnamese in East Dallas. 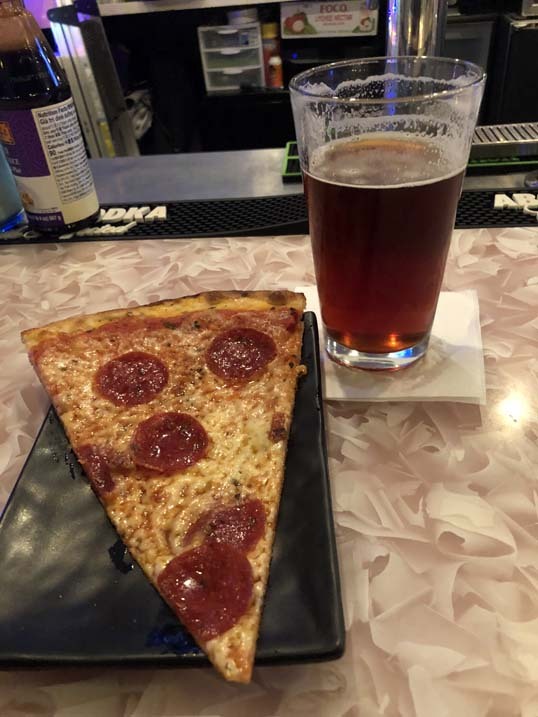 Slice of pizza and a Peticolas Velvet Hammer. A very nice evening. I love that stretch of Fitzhugh in East Dallas – even if it is rapidly gentrifying (there are new upscale apartment blocks going up willy-nilly) – it still has an old lived-in feel with plenty of cheap places to eat (taquerias on every block) – Jimmy’s Food Store is a few blocks on down the road – it’s all very bike friendly. I do get lost on all those diagonal streets, though. But lost in a neighborhood on a bike is a great way to find new stuff, maybe a new adventure. I have a weakness for kitchen gadgets. I always have. By no means am I a gullible person – I believe nothing I see or hear until there is proof. Most of the time. Probably it’s the simple combination of two more basic weaknesses of mine – food and gadgets. The intersection of these frailties leads to a synergistic and symbiotic effect that ends up, in my case as an addiction. The desire to purchase the last kitchen gadget I see is tough to resist. Still, I usually do. I have a lifetime of cobwebby kitchen cabinets full of forgotten contraptions to learn from. My life doesn’t change and I don’t buy the stuff. Of course, the advent of the internet, especially Amazon Prime, has made resisting my obsession infinitely harder. A few keystrokes and a “buy it now” and that box will soon be at my front door. So… I was doing better. And then, about a year ago, came the ultimate kitchen gadget. I resisted for about six months, but the pull became too much. I called up Amazon and ordered a six quart Instant Pot. I have always used an old-school pressure cooker to make beans. It saves time and has the lure of having a bomb steaming away on your stove. And now there is an electric, computer controlled pressure vessel available for consumer use. I had to have one. And, I must say, I really like it. I use it almost every day. The claims of, say, cooking a roast in ten minutes aren’t exactly true… they don’t include the warm up time to bring the food to pressure (which can take a while) or the cooling-down period. That’s not the point though, the big advantage over the old pressure cookers is that you don’t have to watch the damn thing to make sure it doesn’t explode. It’s all controlled by a finicky microprocessor which you command with an absolutely unintelligible array of buttons and an out-of-date red LED display which seems to display random numbers. Still, as long as you ignore all the online recipes and printed instructions, it works. All you do is press “Pressure Cook” and some sane amount of time, and a hot, cooked meal will come out. Oh, and one more thing. I can’t believe it, but I make yogurt in the thing. One of my weekend chores is to make yogurt for the next week. Half gallon milk, can of evaporated milk, boil, put in starter, heat overnight… and there it is. Save a little container for starter on next batch. It sounded so crazy and disgusting I made my first batch as a joke/experiment – but it is so much better than store-bought yogurt, it really is. I use it in a lot of stuff – smoothies, curries, salad dressing, coffee creamer, with walnuts for breakfast. It’s cheap and once you have the routine down, easy. So now I’m happy. I have the ultimate kitchen gadget and I can stop looking… my addiction is done. Wait… Wait! Someone I know has this new thing… an electric lunchbox. It’s a sort of Bento Box with a heating element built in. You fill it with stuff and cook it at your desk. Or in your car! It works on 12 volt or 110! This thing will change my life! Weakness always rears its head…. once an addict, always an addict. 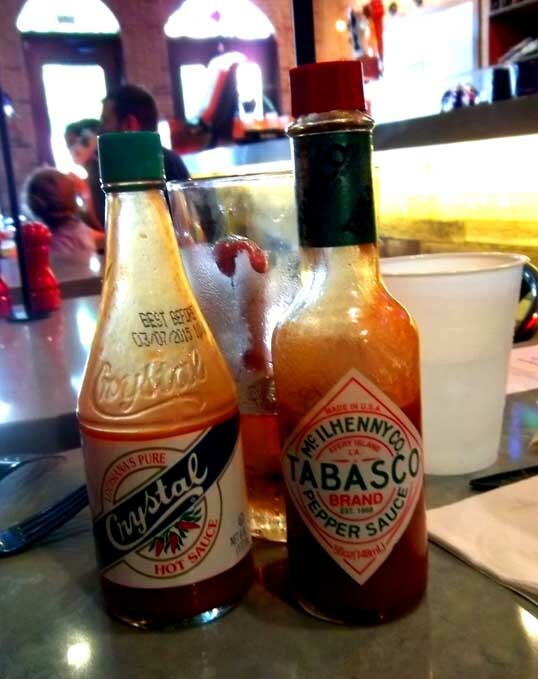 I am all about the hot sauce. 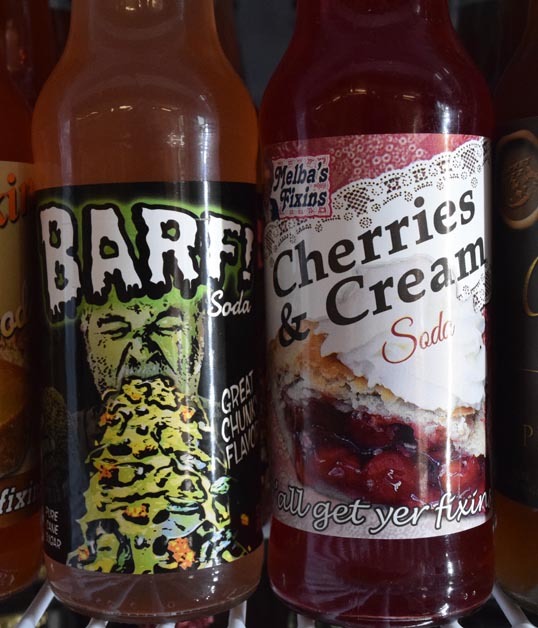 Food exists largely as a means to shovel hot sauce into my mouth. There is a simple test – if it doesn’t make the top of my head sweat – it isn’t hot enough. Ok, I’ve been digging around my archive USB hard drive and found a blog entry from 2006, my second version of The Daily Epiphany, called The Essential Hot Sauces.I had a magazine ask for an article version of this – though they settled for a different one. Right now, I have only three essential hot sauces. There are others that are good, but these are essential. First, is Cholula, the one that I guess would count as my single favorite. 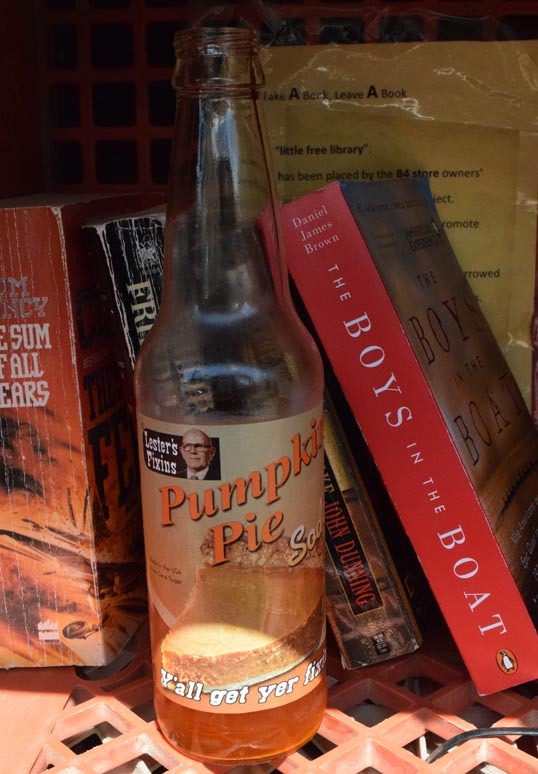 It’s the one with the wooden ball for a cap – easy to spot on a shelf. What makes it special is the fact it is made with Chile Pequin (or Piquin, similar, but not quite there, to the cultivated Tepin), a tiny wild chili instead of some cultivated pepper. The sauce costs more because of that but it has a complex flavor unmatched in cheaper sauces. The third sauce is one I learned to like since 1998. 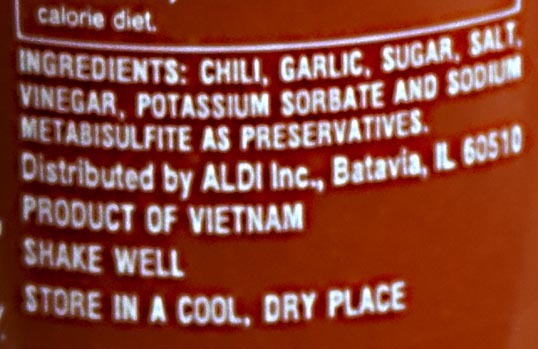 It’s Sriracha, and is an Asian sauce – the one in the plastic squeeze bottle with the rooster on the front. It’s thick too, and a bright orange, and mixes well with other stuff. I think I eat more of this than any other kind. 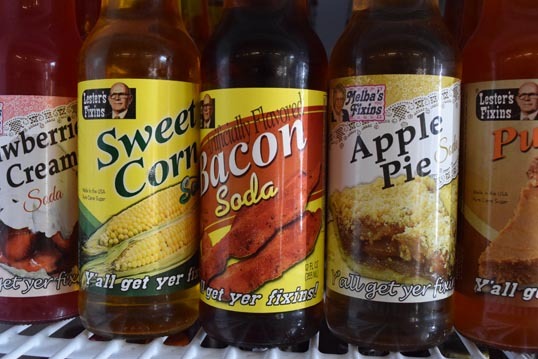 I think I need to add a couple more – a Louisiana sauce at least (Something other than Tabasco – that old favorite seems to be getting too thin and vinagar-y lately) and maybe a habanera-based sauce (these are so hot… I want to find one with some flavor in it). It’s funny to read this after all these years. It’s odd to thing about a time before Sriracha because it is now such a ubiquitous part of my life. Otherwise, those three are still essential. And I wondered about Habanero based sauce. I have a homemade habanero sauce that is great and the link takes you to a blog entry and recipe, but I don’t make it too often – it’s too dangerous (I’m sitting here sweating, just thinking about it). I will buy a Yucateco sauce, green or red, to keep on hand in case of emergencies. Be careful with it, it’s hot. But what I wanted to write about, is that I am addicted to a new hot sauce. We were at a restaurant (already forgotten what it was) and they had a green Sriracha sauce that was delicious. It wasn’t very hot – but it had a great flavor. They had red and green, but the green was something new. What caught my eye was that the bottles were labeled Distributed by ALDI. Aldi, if you don’t know, is this cool new model of a grocery store. There is one at the end of our street and over a block. I like it especially because it is uphill from the house. I ride my bike uphill and then buy milk or water or other heavy items and coast downhill back home. 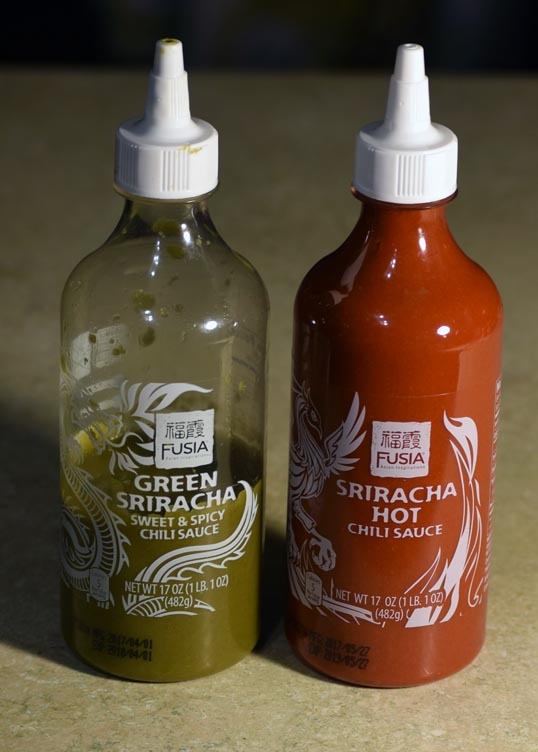 Now every time I go there I buy three bottles of the green Sriracha. I eat a lot of it because it isn’t all that hot – so I put too much on. I put it on everything. And I mean ever-y-thing. It’s too soon to say if I will add it to the essential list – I might tire of it. We’ll see.